At the wedding ceremony of Sir John Cateret (Leslie Howard) and Moonyeen (Norma Shearer), a jealous former boyfriend, Jeremy Wayne (Frederic March) bursts in and fires a gun at Cateret. But Moonyeen rushes forward and is fatally struck instead. John becomes embittered and spends his days mourning his loss. He sits in his garden daily, conversing with her spirit, despite the urging of his friend, Dr. Owen (O.P.Heggie) to move on with his life. One day, Owen informs John that Moonyeen's sister has been killed, leaving behind a five year old daughter, Kathleen. John reluctantly agrees to take Kathleen into his home. 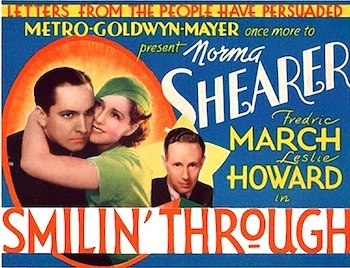 When Kathleen (Norma Shearer) grows to be a young woman, she and her friend, Willie (Ralph Forbes) take shelter from rain in an abandoned mansion. They are interrupted by the arrival of Kenneth Wayne (Frederic March). Kathleen is immediately attracted to him, not realizing that he is the son of the man who killed her aunt. When John learns about their relationship, he forbids Kathleen from seeing Kenneth. But they are in love, and continue to see each other secretly. When Kenneth's military unit is ordered to the war in France, Kathleen begs him to marry her before leaving. Realizing that her uncle will cut off all support for her, Kenneth refuses but promises to return to her. But when he returns four years later, his legs have been badly wounded and he doesn't want to be a burden to her. Hiding his injury, he is cold to her, referring to their past as "our little affair." Kathleen is devastated, but Dr. Owen demands that John tell Kathleen about Kenneth's injury. He refuses at first, but hears the voice of Moonyeen telling him that he risks Kathleen becoming as embittered as is he. John tells Kathleen about Kenneth's condition and urges her to go to him, and to bring him home. He sits down with Owen for a game of chess, and dies in his chair. Moonyeen's spirit appears, his ghost rises, and the two go off together into eternity. 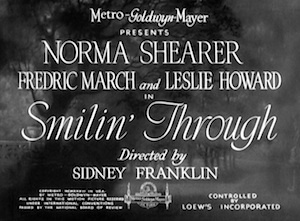 Smilin' Through was remade in 1941 as a Technicolor musical, starring Jeanette MacDonald, Brian Aherne and Gene Raymond in the main roles.